Today I visited the Byzantine and Christian Museum. I arrived at the museum which is built not unlike a traditional Byzantine monastery around a courtyard. 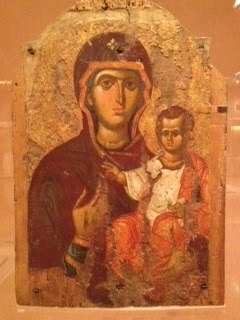 The museum is entirely devoted to Christian art. 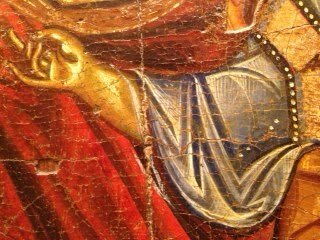 It covered the entire history of Christian art...from pre-Christian influences to contemporary iconographers. 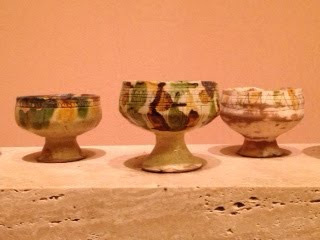 The late antiquities were quite fascinating, especially the collection of glazed pottery. The collection from the Paleaogian Dynasty and early post-Byzantine eras are quite impressive. 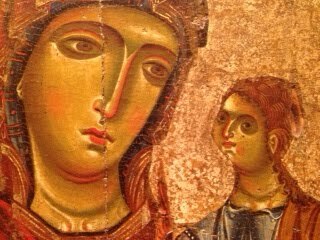 This period was the most highly-developed period in iconography that produced the some of the finest masterpieces and greatest prototypes in Orthodox Christian art. 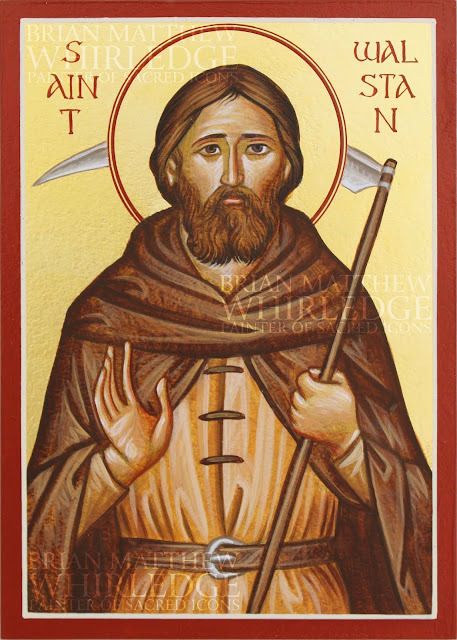 There was a sufficiently brief nod to the baroque-influences iconography of the 18th-19th centuries (maybe not a brief enough nod...that is a pretty sad period until the 20th century when the Orthodox returned to the traditional style). 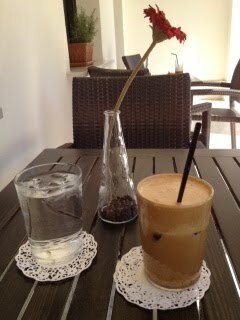 It was overwhelming, so I took a break, got a μεγάλο φράππε, γλυκό, με γάλα (large frappe with sugar and milk), and called Bekah, who was about to leave for the airport. Then I returned to study the icons for a while. 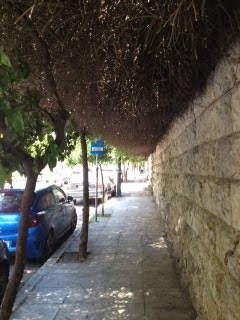 I blazed a new way through Kolonaki to get to my teacher's apartment for the lesson. 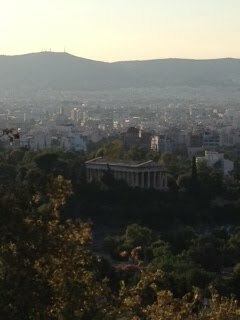 I knew I had to go due north, except I had to get around Lykavittos Hill. 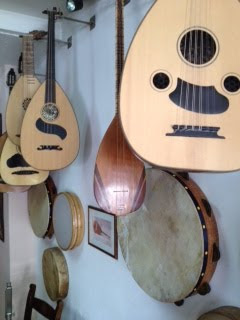 After the lesson, per Arvanitis' recommendation, I found a tamboura shop and played around. 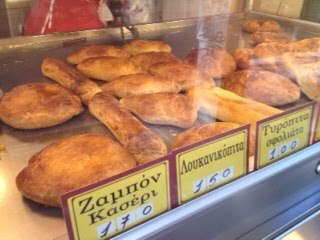 I may leave Greece with one. They are pretty amazing instruments. I passed (I'm not exaggerating) a dozen shops selling model kits on my way to Prodropion for lunch. I simply got a gyro...which filled me up and only cost 2.20€! 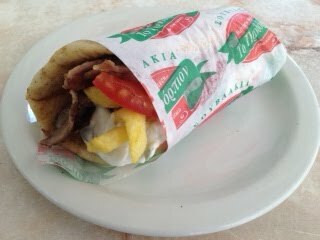 It was the best gyro I've had here, I must add. Everything was stuffed inside the pita...even the french fries! I went to the copy shop to add blank pages to my Margaziotis text for notes (which they kindly did for nothing). On my way to the copy shop, I passed a bookstore (one of many), but this one had a few books with icons on the cover. After the copy shop, I headed straight back to my apartment. After a few blocks, I decided to turn around to try to find that bookstore again. 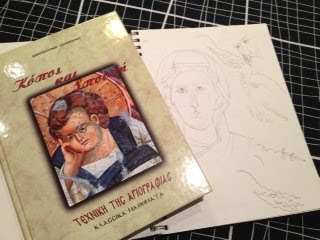 I've been looking for an elusive Greek iconography textbook that is very thorough, step-by-step, and mostly illustrations. Did I mention that it is out of print? I've been looking all over Athens for it, since it is unavailable in the states. Well, somehow I stumbled back across this bookstore. Of course they had the book I was looking for. At the bookstore, I ran into a very friendly and enthuiastic man named Panagiotis who noticed my accent and asked where I was from. "Near Chicago," as I usually reply. Everyone (I'm not kidding) in Athens has a cousin in Chicago and knows where that is. 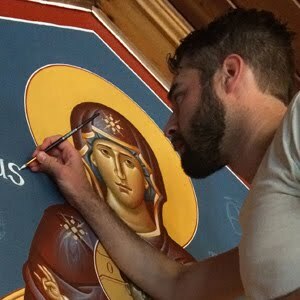 Not surprisingly, Panagiotis used to live in Chicago, and has been to the local Serbian monastery in New Carlisle, IN. Also, he didn't look at me like I had a second head when I told him I converted to Orthodoxy and that my parents aren't Greek. 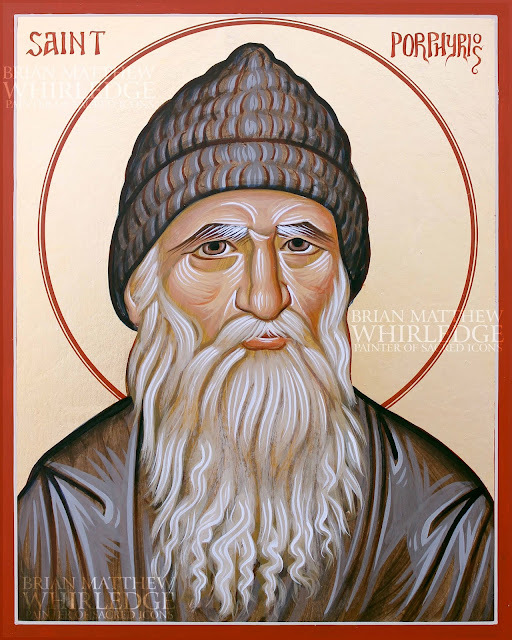 He thinks it is wonderful that people are joining the Orthodox Church. 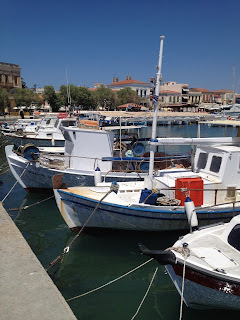 He wants to help me see St. Nektarios on Aegina, and St. Ephraim in Nea Makri. This is where the conversation changed: "Are you going to Agion Oros (lit. 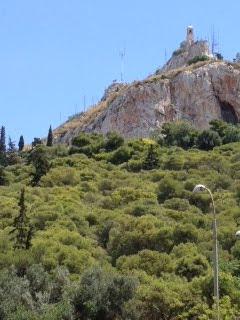 the "Holy Mountain," i. e. Mount Athos)?" "Well," I said, "I think it's too late notice, and besides I don't know anyone there." To maintain the prayer and holiness, a specific, limited number of pilgrims are admitted each day, and to get in, one needs a visa issued from the inside...you literally have to know someone. "You can't visit Greece without seeing the Holy Mountain. I know an elder. It will be no problem to get you in," he reassured. After buying the book (they cut me a great price), Panagiotes insisted on taking me back to my apartment on his "motorcycle," which was really a scooter no different than anyone else's. 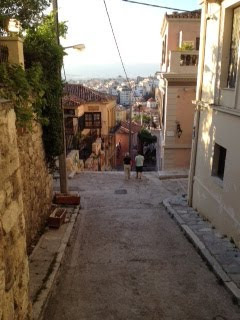 Riding down some of the busiest streets in Athens (zipping between cabs and pedestrians) on the back of a scooter was quite an adventure that I do not wish to repeat. I made it back to my apartment, rested for a minute, then went to Plaka to pick up the icon of St. Polydoros from his relics and to attend vespers at St. Demitrios. I walked to the Herod Atticus Amphitheater to get tickets for an Opera on Sunday. I'm excited to see an opera in an ancient amphitheater on Sunday. I heard them practice...it will be good. I had moussaka for dinner at a taverna with a view of the acropolis. 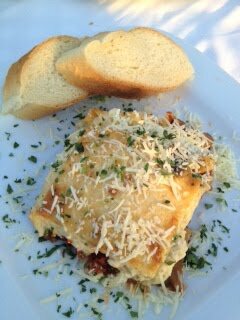 The moussaka had minced meat, potato, and eggplant, baked in a custard, and covered with parmesan cheese. As I write this, my wife is in the air over the Atlantic. Tomorrow, she will join me in my adventures. We have really been enjoying your blog! A. drools on the keyboard every time he reads it...You need to stop posting pictures of all the wonderful things you are eating! ;) We are praying that B. makes it safely there! 2. Can you use a larger font for us old folk? 3. The right sidebar is hard to read. Would you consider either a different color combo, or a larger font? 4. Lovelovelove the blog and have duly subscribed!